Enoteca is an Italian word, which literally means “wine library”. The term is used to describe a special type of local or regional wine shop that provides locals and tourists with an opportunity to taste regional wines. The friendly staff provides hands-on information about these local wines and refers customers directly to the producer if they wish purchase larger quantities of wine after tasting them. This was exactly the idea Anne Root, owner of EdenVale Winery, had in mind when she established Ashland’s very own wine library, Enoteca Wine Bar & Bistro, located in the heart of downtown Ashland on the plaza. In addition to regional wines, Enoteca offers local beer, small plates, live music, and other fun activities throughout the week. We spoke with Anne and her knowledgeable staff to discuss her vision behind Enoteca and the future of wine in Southern Oregon. Anne, thanks for being here today. What a great idea of creating a local wine library, this is a very exciting addition you have introduced to our community. Can you please tell us more about your inspiration for starting Ashland’s Enoteca? I really wanted to celebrate everything southern Oregon has to offer. I believe it is important to support your local industries and Enoteca provides a place to access southern Oregon’s great local products and find more information about them. At Enoteca guests not only get to taste EdenVale’s award winning wines but they also have access to other local products produced in our region, whether wine, beer, or food. We provide a cozy atmosphere in a beautiful and comfortable setting where our friendly staff can provide guests with a great experience. We are able to share our local knowledge with visitors and provide a concierge service to offer information and point people towards local wineries, art galleries, restaurants and other must see attractions. Although Enoteca is owned by EdenVale Winery, you also represent many different local wines by other producers, will give us a little tour of your wine library? We bring in different wines from various southern Oregon producers that rotate on our shelves. These wines are available for sale by the bottle to enjoy at Enoteca or at home. With wines available for as low as $10 a bottle, Enoteca is a great place to access local wines for a reasonable price. Every Friday we offer a Featured Wine Flight, where guests can taste a variety of southern Oregon wines. Coming up this December, we are going to have a Pinot Noir featured flight and a dessert wine featured flight. These types of wine are great additions to holiday menus, and sampling them from a variety of producers as part of a wine flight is a great way to find something you love. We will also host a guest winery during December to come pour their wine, it will be a great opportunity to meet a local winery representative and have a conversation with them in a comfortable setting. 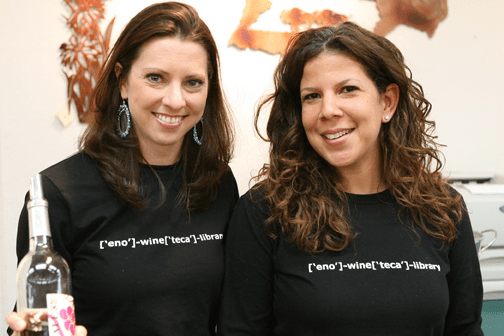 Will you introduce us to some of Enoteca’s staff members? Misty Santos has worked with us, both at Enoteca and EdenVale for about 4 years. 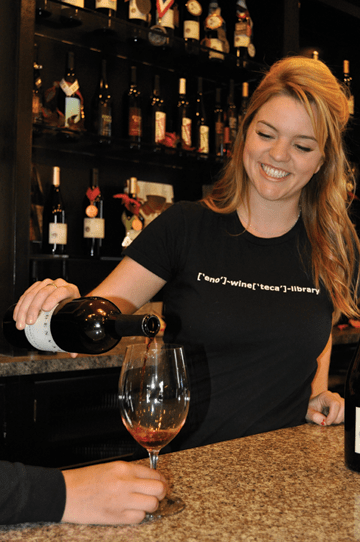 Misty studied Business Administration at SOU, and fell in love with the wine industry when she took a wine appreciation class with Lorn Razzano, a wine educator and the founder of Ashland Wine Cellar. After working for a couple different local wineries, Misty found her home with EdenVale where she oversees sales for the Winery. Kaycee Wegener recently joined EdenVale’s team to assist with marketing and public relations. Kaycee comes to us with over 3 years of wine marketing and event experience. Kaycee loves interacting with people and is a great asset to Enoteca, making sure to give all our guests special attention and expert knowledge each time they walk through our door. Misty, will you tell us a bit more about what Enoteca has to offer to our community? Enoteca is more than just a wine tasting room. Besides the bar downstairs, we have a beautiful seating area upstairs with cozy couches and tables that overlook the Ashland Plaza. Enoteca is a wonderful place to enjoy a glass of wine or beer. We also offer cheese plates, antipasta platters, flatbread pizza, seasonal soup and other small bites. We want Ashland locals and visitors to remember Enoteca as the premier destination to relax and visit with good wine, food and company. We love being involved in the community and Enoteca is a proud member of the Ashland Gallery Association, which celebrates local art and artists. Continuing on through December, Enoteca is showcasing local photographer Steven Addington’s beautiful and unique photos. Steven has been the photographer for various Southern Oregon events such as the Britt Festival, Taste of Ashland, Art Along the Rogue, Brews and Boogie, and Hearts and Vines. Kaycee will you tell us about one of your favorite local wines? I love pairing wine with foods, so every time a taste a new wine I think about which foods would compliment it well. My current favorite food pairing combination is red wine and dark chocolate. I love EdenVale’s 05 Reserve Syrah with Lillie Belle Farms’ Purple Haze dark chocolate bar. The Syrah is incredibly smooth which compliments the creaminess of the chocolate. The black cherry fruit in the wine provides a sweetness that elevates the chocolate flavors, while the oak enhances the cacao bean and toasted coffee notes. I find it very exciting when a wine and food combination enhances the flavors of each other. Misty do you have any wine recommendations that come to mind? I have a lot of recommendations, that’s the great thing about Enoteca, you get a chance to taste and choose from a wide variety of wines. We have about 20 different wines on our shelves beyond those produced by EdenVale, and with our rotating flights you get a chance to sample a little bit of everything. Some of my local favorites are WM Augustus 2009 Cabernet Franc produced by Velocity Cellars, Devitt Winery’s 06 Syrah and Grizzly Peak’s 2011 Tempranillo Blanco. Anne, EdenVale has been recognized internationally for its wine and has currently been producing wine for 11 years. Will you tell us a little about the history of your winery? In 2003, EdenVale Winery released its inaugural 2001 vintage. We are honored and excited to participate in the fast-growing Oregon wine industry. As Oregon becomes more renown for its flavorful and robust wines, our goal is to do our part in achieving greater recognition by creating top quality, enjoyable wines. The EdenVale Winery facility and visitor center is located on property widely recognized as the birthplace of Oregon’s commercial pear industry at Eden Valley Orchards in Medford. Amidst this significant historic setting surrounded by pear orchards, the EdenVale Winery now concentrates on making the finest wines in southern Oregon, specializing in Syrah, Viognier, Malbec, Cab Franc, Tempranillo, Grenache, Pinot Noir and Chardonnay with the same passion and great care that has always been an important tradition. We also support the agricultural heritage, modern-day farms and artisan businesses that express the region’s bounty and diversity by selling featured products at the winery tasting room and at Enoteca. Enoteca in Ashland also hosts a variety of events throughout the week, Kaycee, can you tell us a little bit more about what you have going on? Beyond wine and food, Enoteca offers weekly events to cater to a variety of entertainment preferences. We host a Spaghetti Game Night every Wednesday, with complimentary pasta with any wine purchase and board games provided byAshland’s Fun Again Games! Ladies’ Night is every Thursday, where female patrons receive $2 off all glasses of wine and 10% off bottle purchases. Other events include live music every Friday and Saturday night, Featured Wine Flights every Friday evening, and wine and food pairings all day Saturday and Sunday. We also welcome guests to consider Enoteca for their special events. Whether for a holiday party, birthday celebration, wedding shower, social club gathering, networking group or a business meeting, Enoteca will work with you to plan a beautiful and memorable event. You can reserve the entire upstairs seating area for your private event and we can provide formal dinning or a cocktail reception with wine, food, and live music. Right now through the end of March, we are happy to offer the space for special events without a reservation fee. Misty, what is the best compliment you have received from a guest visiting Enoteca? I think people can sometimes get intimated when they go to tasting rooms and expect the people behind the bar to be snobby wine experts, but in reality that is usually not the case. When you come into Enoteca you are greeted by welcoming staff who presents information in a friendly manner. We understand that everyone comes from different backgrounds, whether a wine novice or an industry professional, and we want everyone to have a great experience. Our staff believes that we can learn as much from our guests as they can learn from us. The best compliment is when, after a tasting, a group thanks me for providing a welcoming atmosphere were they were not intimidated to offer their own thoughts and opinions about the wine, it is not just me teaching people about our wine but having a conversation where everyone is able to share their own knowledge and experience. Kaycee, you also have a variety of classes coming up, can you tell us about some of these? Starting in January, we will continue our quarterly wine education classes, Taste Rouge Wine 102 in the upstairs area at Enoteca. It is very informative, but also a casual and fun experience and we provide wine tasting and food at each class. Our next class will be on wine and health taught by Michael Altman, a nutrition professor at Southern Oregon University. Michael was one of our educators last year and everyone enjoyed his class, we are very excited to have him back. We are also planning on hosting classes on topics such as a sensory evaluation of wine, effects of terrior and climate on wine production, and a winemaking and blending class. 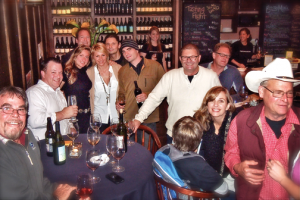 Our educators include wine makers, local growers, professors, and wine stewards. Finally, Anne, let’s end with a final thought on the long-term vision you hope to create with Enoteca in Ashland. We really want to create a culture of supporting our local industries. Whether local wines, beers, art, food, or products, Enoteca helps introduce Ashland residents and visitors to the bounty of southern Oregon. And Enoteca provides a great local space to access and enjoy these amazing local products.